December 19th, 2015. The Digimon World -next 0rder- title site updated with the game's Jump Festa 2016 trailer, showing off the game's voice acting and its opening theme performed by Aoi Eir, Accentia. In the trailer, protagonists Takuto & Shiki are shown being transported by their Digimon Mini virtual pet into the Digital World. 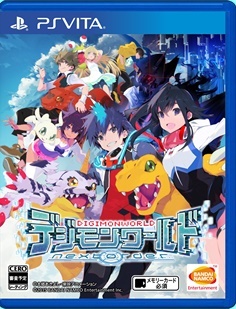 The trailer features several new locations that resemble classic Digimon World locales, like Factorial Town, the Dark Lord Mansion, and Great Canyon. Training gyms, the dual partner system, and ExE-volution all are shown in the trailer, as is the enigmatic Omegamon variant Executor and the new character Tsuzuki Shouma. The trailer's slogan is "Our world is evolving," and it prominently features the phrase "Was the World waiting for you? Or were you waiting for the World?" Accentia will launch on March 2nd, fifteen days before the game. Digimon World -next 0rder- will launch in Japan on March 17th, 2015, on the PlayStation Vita for 6,800 yen. (Approximately $56 at the current exchange rate.) More translations are forthcoming. so cool they bring back all main digimon character from all franchise into this game... that big awesome there... but there's certain moment i dislike not favour this kinda lighting and render... i hope it not yet finalized like how first cyber sleuth....over all nice OP... kinda feel like animeish glad main char got his VO... also the last part voice kinda hint its DW1 protagonis voice... Gaioumon vs that Omegamon Zwart! ?